This year’s Niagara Icewine Festival is taking place from January 27th-29th at the Scotiabank Convention Centre, offering guests the chance to sip their way through wines from over 20 Niagara wineries and experience delicious culinary creations from some of Niagara’s top chefs. 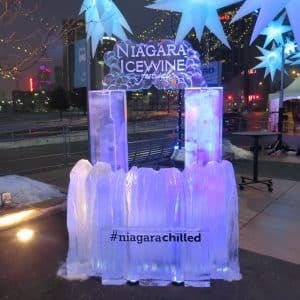 With live entertainment, famous Niagara icewine, and an outdoor Icewine Winter Wonderland where you can roast one-of-a-kind Peller Estates Icewine Marshmallows, this is a one-stop destination where you can experience the very best of Niagara’s “liquid gold” in one magical setting. Chef Jamie Kennedy and the team at Windows by Jamie Kennedy Fresh Grill & Wine Bar will be paying homage to Niagara’s world-famous “liquid gold” with a special Icewine Dinner as part of Falls Avenue Resort’s Niagara Culinary Experiences series. This spectacular evening will offer guests a unique 5-course dinner menu that includes dishes like Foie Gras Terrine served with Apricot Icewine Chutney, Roasted Cauliflower Soup, and Chocolate Pot de Creme, all to be enjoyed in direct view of the magnificent Niagara Falls. The Xerox Icewine Gala is an extraordinary annual event taking place on January 13th at Fallsview Casino Resort. This year’s “Sugar and Spice and Everything Ice” gala will be an elegant, all-inclusive affair that connects guests with many internationally acclaimed VQA icewines and table wines as well as incredible food prepared by Fallsview Casino Resort’s top chefs, making for a truly unforgettable winter evening in Niagara Falls. The beautiful and historic Queen Street in Niagara-on-the-Lake will be transformed into a spectacular winter wonderland known as the Icewine Village from January 21st-22nd in celebration of amazing Niagara Icewine. Guests will be able to try icewines from many of the Niagara Peninsula’s top wineries, indulge in icewine-inspired dishes from some of the region’s top chefs, and experience the charm and magic of Niagara-on-the-Lake in winter. On January 21st, some of Niagara-on-the-Lake’s finest mixologists will be competing to create the best Icewine cocktail at the Flash and Panache Icewine Cocktail Competition on Queen Street in historic downtown Niagara-on-the-Lake. Only one person can take home the crown, but there is no doubt that each of the cocktails will showcase the sweet and delicious flavour of one of Niagara’s most famous wines.